1960s Music – 1969 was a year that showcased a lot of diversity in musical tastes. On one hand R&B, pop, country and folk all still controlled the charts and was what the radio stations played the most. Old favorites like Elvis with “Suspicious Minds”, Tommy James And The Shondells with “Crimson And Clover”, the Beatles with “Get Back” and The Supremes’ “Someday We’ll Be Together” were all #1 hits. Frank Sinatra who’s successes spanned from the 1940’s to forever had two top 40 hits with “Love’s Been Good To Me” and one of his all time greatest hits “My Way”. Also in the top 40 were Johnny cash with “A Boy Named Sue” and Tammy Wynette with “Stand By Your Man” a song which proved not to be very popular with the growing feminist movement. Some newcomers got in the charts as well. The Zombies only hit “Time of the Season” actually made it to #3 on the chart after the group had broken up. Friends of Distinction had their first hit with “Grazing In The Grass” and Piero Umiliani’s only radio hit was “Mah Nà Mah Nà” which was made popular by The Muppets on their show “Sesame Street”. Creedence Clearwater Revival had one of their best years with 3 songs in the Top 40, “Proud Mary”, “Bad Moon Rising” and “Green River”. “Proud Mary” would become one of the most covered songs of the day with Ike & Tina Turner’s version becoming their biggest hit two years later. On the other side of the music world was the psychedelic, acid and hard rock genres. Popular with the protest culture some of these songs would prove to be anthems of the movement. Rock wasn’t the only popular genre with the hippies. The anti establishments musical tastes included folk, southern rock, blues, R&B and African tribal. A lot of the new music contained elements of all of these. And then there was Woodstock. Without doubt the Woodstock Music & Art Fair was the most important musical event of the decade. Billed as 3 Days of Peace & Music it morphed into an all out drug induced rain soaked, muddy love fest. 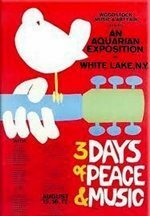 Half a million teenagers and young adults crowed into a farm in upstate New York to live for three violence free days and listen to the absolutely biggest line up of musicians to ever appear at one concert. Acts included (in order of appearance) Richie Havens, Bert Sommer, Tim Hardin, Ravi Shankar, Melanie Safka, Arlo Guthrie, Joan Baez, Quill, Country Joe McDonald, John Sebastian, Keef Hartley Band, Santana, The Incredible String Band,v Canned Heat, Mountain,v Grateful Dead, Creedence Clearwater Revival, Janis Joplin with The Kozmic Blues Band, Sly & the Family Stone, The Who, Jefferson Airplane, Joe Cocker, Country Joe and the Fish, Ten Years After, The Band, Johnny Winter with Edgar Winter, Blood, Sweat & Tears, Crosby, Stills, Nash & Young, Paul Butterfield Blues Band, Sha-Na-Na and closing the concert Jimi Hendrix. With a few exceptions these were not well known main stream bands. Popular groups like The Rolling Stones or the Beatles were not invited to this venue, mostly because the promoters would never be able to afford them and still see a profit. Creedence Clearwater revival was the first to be signed up and because of their popularity other well known groups agreed to appear. The groups that did appear were mostly counter culture anti-war, civil rights protestors who were huge stars in the college and hippie communities.